For the most part, developers have bypassed south metro Atlanta when looking for locations for signature mixed-use developments such as Ponce City Market in Midtown or Avalon in Alpharetta. After years of suburban sprawl designed around cars and neighborhoods without sidewalks, leaders in Henry, Clayton and South Fulton counties have set aside large tracts of land they hope will develop into the walkable, more neighbor-friendly communities popular north of downtown. One project that launched two years ago, Pinewood Forest in Fayetteville, has become an important example to south metro leaders as they try to attract big mixed-use development dollars to their communities. “If you build special places, people will come,” said Rob Parker, Pinewood’s president and a resident of the community. The 235-acre development of apartments, townhouses and million-dollar homes on postage stamp lots has sold more than 90 homes since 2018, including 12 so far this year. 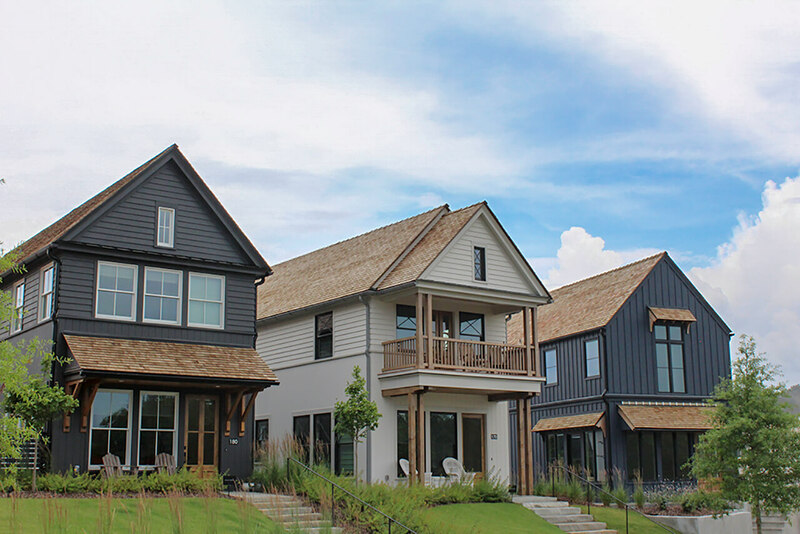 Unlike most of Fayette County, where families live in large houses on acre lots, Pinewood is offering everything from tiny houses to homes of more than 2,000 square feet built vertically instead of horizontally. It’s a managed rollout, leaders say of the community across the street from Pinewood Studios, home of Marvel Studios films “Black Panther,” “Captain Marvel” and “Avengers.” When it’s built out in 2024, developers hope to have created a community of 700 family homes designed around sidewalks, pocket parks and centralized gathering spaces to encourage residents to know their neighbors. Shannon James, chairman of Aerotropolis Atlanta Alliance, an organization helping College Park and others to plan a 320-acre mixed use project around Hartsfield-Jackson International Airport dubbed Airport City, said Pinewood is offering a model to others wanting to develop mixed-use projects south of I-20. Other mixed-use projects in the early planning stages on the Southside include a large tract in Clayton County’s Mountain View area near the airport and the Jodeco project in Stockbridge. A critical part that is making Pinewood viable is having the right team to see the project through, James said. One reason the Southside has not seen as much mixed-use development is the abundance of land never pressured developers to consider density. “There is a reason that you typically get higher density and go more vertical as the land price goes up,” said Kennesaw State University economist Roger Tutterow. Pinewood officials are selling more than housing as a reason to choose their community. The amenities are scaled to the size of the community, according to Parker. The restaurants will have no more than 50 to 60 seats instead of 200 chairs at an average eatery to better reflect expected occupancy. The theater also will be smaller than the big mega-plexes to make the financial numbers work. Operators are looking to bring in a boutique 5,000- to 7,000-square-foot grocery store along the lines of a Trader Joe’s or Sprouts. Most important for Pinewood officials, however, is to attract people who are looking for a walkable community. The target is the millennial who wants to be able to go to a movie, then go to the grocery store and work out at the gym without having to get in her car, Parker said. The community also wants the empty-nester who wants trade in his lawn mower for comfortable shoes to walk 10 feet away to a park. In between, there will be people working at Pinewood Studios or Delta Air Lines pilots coming home to a no-fuss apartment after a long flight.